Despite having saddled itself with the dire name of Centrair Airport, Japan’s newest air facility, which opened last month near Nagoya, looks to have started off well enough. Like Kansai International Airport, Centrair has been built on an offshore artificial island. But whereas Kansai International has physically subsided 12 meters and sunk into a financial pit as investment has subsided even more drastically, Centrair has been built on solid seabed and was constructed under budget. Also unlike its Kansai cousin, Centrair has an interesting spot right on its doorstep — a town by the name of Tokoname. Most passengers arriving at Centrair will naturally want to whisk themselves with all due haste straight to Nagoya — on that trundling little Meitetsu Line that takes absolutely forever. But Tokoname is an interesting town and most definitely worth a stop, even if you don’t happen to be an aficionado of the commodity with which it is most closely associated. 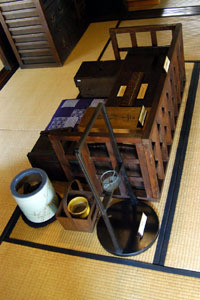 Since ancient times, Tokoname has been one of the great centers of ceramic production in Japan. As you might expect, Tokoname has quite a soft spot for the ceramics it has been producing since way back when. Pottery is practically the first thing you step on as you leave the station, that pottery being in the form of rounded shards set into the pavement — the same shards that are seen in the town’s most historic environs. 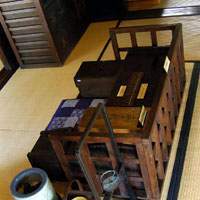 Also displayed at the station and other points in the town are the large meter-high, brick-red shochu containers that Toko- name once produced in vast numbers. The area that most tourists head for is the old ceramic-producing heart of the town, usually visited on one of two courses that are together known as the Pottery Path (Yakimono Sampomichi) which is lined with the workshops of the many craftsmen who keep the area’s ceramic tradition alive. Dominating the landscape here are the truncated stumps of brick-built kiln chimneys, which are now no more than 5 to 10 meters high, though originally they were two or three times taller. A large photo in Tokoname Ceramic Hall at the beginning of the Pottery Path shows how those chimneys looked in their heyday in the early ’60s, when the town had an industrial bleakness not unlike that of the potteries’ region in northern England. The gradual transition to gas and electric kilns made the tall chimneys redundant, and their height was reduced so that they would not topple over and crush anyone in the event of an earthquake. This kind of through-draft kiln revolutionized the firing of ceramics after the Japanese learned the technique from the Koreans — one of the few positive things the Japanese gained from their invasions of that peninsula in the 1590s. The kiln consisted of a series of chambers built into a hillside, with the heat from the firebox at the bottom rising through the successive chambers. Tokoname’s climbing kiln was built in 1886 and was still being used as late as 1974. At the top of the kiln stands a row of 10 smoke flues, which is one of the town’s most distinctive sights. For most people, a drainpipe is, well, just a drainpipe. But in Tokoname, so many were produced that the drainpipe has entered the aesthetic sensibilities of the locals. Toko- name must be one of the few places in the world where drainpipes are prized for their ornamental qualities. In the older area of Tokoname, drainpipes and shochu containers are seen everywhere, decoratively set along paths or built into hillsides as retaining structures. And this use of the pipes is no embellishment introduced for the benefit of rubberneckers: Drainpipes are used in this way near ordinary homes, far from the main visitor routes. The one part of the town where most visitors cannot resist stopping to have a photo of themselves taken against those beguiling drainpipes is Dokanzaka. Here, banks of the clay pipes and shochu containers flank the pathway and, completing the ceramic ambience, shards from discarded pottery are set into the path, providing traction underfoot in slippery weather. Pipes are also behind the story of the town’s hero. Hoju Koie thrust greatness on Tokoname when in the latter half of the 19th century he devised a method for mass-producing drainpipes using wooden molds. These clay pipes now account for more than 50 percent of the town’s industrial output. In recognition of Koie’s contribution to their prosperity, grateful locals erected a statue of him on the Pottery Path, executed — naturally — in ceramic. Just below Dokanzaka is the highlight of the Pottery Path — the former residence of the Takita family. The house once belonged to a shipping company that delivered the wares of Tokoname by sea to Edo (former Tokyo) and Osaka. Though this house long stood in a sorry state of disrepair, it has recently been painstakingly refurbished and provides an atmospheric glimpse into the way people lived here a century and a half ago. Another picturesque spot can be found a little further down the coast in a town called Mihama. Here, a white, 18-meter-high lighthouse stands rather attractively on a rocky shoreline among a cluster of palm trees that you suspect didn’t just happen to be there. This pint-size lighthouse is no bad place to spend the end of the day. And it is quite a romantic spot, with the waves crashing into the shore and the small fishing boats scurrying home across Ise Bay — provided, of course, that you mentally blot out the sound of all those jets rumbling in to Centrair.